Thousands gathered in Texas cities and around the country Saturday to protest the separation of undocumented children from their families. More than 2,000 children remain separated from their families due to Donald Trump's "zero tolerance" policy of criminally prosecuting all illegal entries. AUSTIN – As the temperature inched to the triple digits and sweating crowds swarmed the south lawn of the Texas Capitol, speakers declared with grief, hope, indignation and determination that the Trump administration's immigration policies do not reflect their values. Parents brought their children. Grandparents brought their grandchildren. College friends and church groups all stood and cheered as, one after another, immigrants, activists, doctors and religious leaders took to the stage and called for the reunification of the thousands of immigrant children who were separated from their parents by the federal government when crossing into the United States. 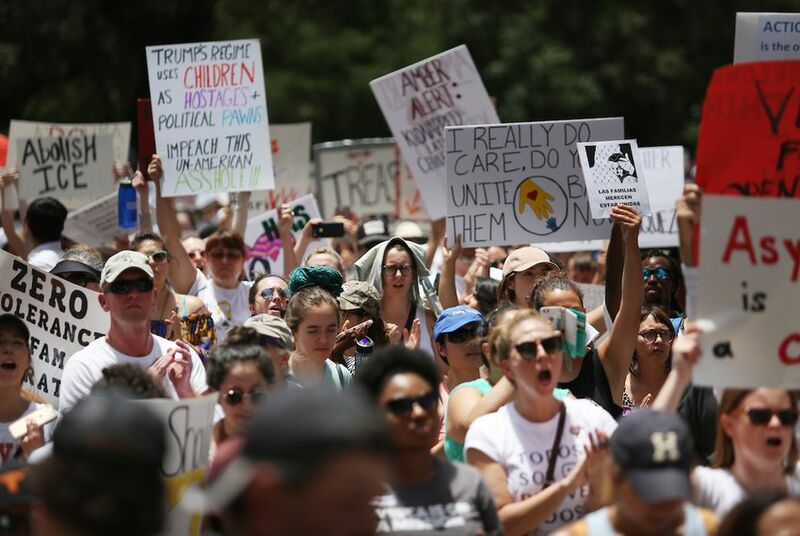 The "Families Belong Together" rally in Austin was just one of many held across the state and nation, from Houston and El Paso to Washington, D.C., and New York City to Dodge City, Kansas, and Missoula, Montana. President Donald Trump signed an executive order last week effectively ending the separation of children from their families at the border. Children had originally been separated under Trump's "zero tolerance" policy of criminalizing all illegal border crossings. As children cannot be sent to jail, they were taken from their families and placed into foster care. More than 2,000 children remain separated from their families, and logistical chaos continues to hinder reunification. On Friday, the Justice Department revealed in a court filing that the Trump administration plans to begin detaining migrant families together in custody rather than releasing them. Along with the event in Austin, large groups gathered in other Texas cities as well on Saturday. Thousands attended rallies at the city halls in Houston and Dallas, according to media reports. At the Houston event, attendees at one point marched to U.S. Sen. Ted Cruz’s downtown Houston office, according to the Houston Chronicle. In El Paso, several hundred people took part in a rally at the front of the Paso del Norte international bridge downtown, according to the El Paso Times. More than 50 organizations partnered to co-host the event in Austin, which drew Austin Mayor Steve Adler and state Rep. Donna Howard, D-Austin. Sulma Franco, an undocumented Guatemalan immigrant who came to the United States in 2009, spoke to the crowd in Austin about how she has been "fighting almost eight years" against the current immigration system that she says is not made for immigrants but rather for keeping them out. Franco said she had a direct deportation order when she first crossed because she did not have enough "factual evidence" to prove her asylum case. "I am running away from something. I'm not on vacation," she said to the crowd in Spanish. "When you're running from something, you leave with nothing." Austin immigration lawyer Kate Lincoln-Goldfinch spoke about her clients' experiences having their children taken from them at the border. She described one client she called Nancy whose 5-year-old son was ripped from her arms shortly after crossing into the United States in search of asylum. Lincoln-Goldfinch said some of her clients described more manipulative tactics for separating children, such as children being taken into a separate room to be photographed and never coming back. Despite Trump's executive order ending family separations, Nancy remains detained and separated from her son, Lincoln-Goldfinch said. The continued separation of families is what brought many out to the rally in Austin. Cathy Snider, 60, a microbiologist from Elgin, said Trump's recent executive order has not done anything to reunify families that have already been separated. "It's absolutely horrifying to think our government is engaging in this brutality," Snider said. "And there's no plan to reunite parents. [Trump] may have done this action, but I don't think there's the political will to do it." Luis Olais, a 23-year-old Austin resident who moved to Texas from Mexico at age 3, said the idea that immigrants have to go through bureaucratic hoops to be reunited with their children is absurd. "Why do you have to reclaim them if they're your own kids?" he said. "Those who legislate and govern must answer at the polls for their acts," he said. Disclosure: Steve Adler is a former board member and has been a financial supporter of The Texas Tribune, a nonprofit, nonpartisan news organization that is funded in part by donations from members, foundations and corporate sponsors. Financial supporters play no role in the Tribune's journalism. Find a complete list of them here.